Our selection of free craft eBooks is the ultimate resource for crafting. Whether you need a thrifty home decor project or a graduation gift idea, FaveCrafts.com has you covered. Click, download and print any eBook for easy reference while crafting. For help downloading our eBooks, see our help document here. DIY Christmas crafts are the easiest way to deck your halls with a unique, personalized touch this holiday season. Adding your own personal flare to Christmas décor gives a certain warmth to your home that you just can’t buy in stores. The homemade Christmas decorations in this free PDF will give you a bounty of ideas to keep you jolly and festive all season long. Get your copy today! We love to host a variety of contests on FaveCrafts each year. In October, we asked readers and bloggers alike to submit beautiful ornament tutorials to FaveCrafts as a way of celebrating the holiday season. In November, site visitors were invited and encouraged to vote for their favorite ornaments. The ornaments with the most page views won, and those top ten ornaments can be found in this wonderful new eBook! Get your copy today! Celebrate the festive holiday season by coloring! This collection created by Carol Foldvary-Anderson includes beautifully designed holiday icons. Some pages will take longer to color than others, giving you an opportunity to squeeze some coloring time in between making gifts for family and friends and filling your home with DIY projects to create a festive mood around the house. Get your copy today! 2012 Holiday Gift Guide for Crafters: Looking for some suggestions on what to get the crafter in your life? Or maybe you're a crafter looking for a few supplies to add to your wish list. If you love crafting, or know someone who does, you're sure to love our 2012 Holiday Gift Guide for Crafters. Jolly Holidays: 15 Free Knit and Crochet Gifts and Holiday Projects eBook: Red Heart Yarn and FaveCrafts are proud to present their latest Christmas eBook. Make your holiday celebration a homemade one using the festive knit and crochet patterns found in this free eBook. 23 Gingerbread House Designs and Recipes eBook: Whether you prefer to flaunt your creativity by creating elaborate gingerbread house designs, or you prefer to snack on gingerbread cookies, 23 Gingerbread House Designs and Recipes will help you experience that special Christmas spirit. 12 Fun & Fabulous Mod Podge Projects:Jewelry, Gifts & Decorations for the Holidays eBook from Plaid: Learn how to use Mod Podge to create 12 great projects from holiday projects to great jewelry and decoupage gifts. Decoupage ideas and basics are provided in this eBook. 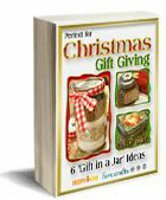 Perfect for Christmas Gift Giving: 6 'Gift in a Jar' Ideas eBook: Give Christmas in a jar with these great ideas. From recipes to beauty aids, these 6 'gift in a jar' ideas are perfect for homemade gifts. The Make My Own Holiday Gifts Guide eBook: Find 12 easy Christmas crafts for holiday gifts to make this season. Find sewn Christmas gifts, Christmas ornament crafts and homemade Christmas decorations. Homemade Christmas Gift Guide eBook: Find 32 craft projects to make for holiday gift-giving, including jewelry, sewing projects, knit items and decorative home accents. These gifts are organized by recipient, including mom, boyfriend, friends and even office gift exchanges. 34 Holiday Ideas for Gifts in a Jar eBook: The team at FaveCrafts and our sister site RecipeLion.com have put together a great gifts in a jar eBook. In this 49-page eBook you can find 34 great holiday ideas for gifts in a jar. Santa's Guide to Easy Christmas Crafts for Kids eBook: Included in this eBook is our collection of our best kids Christmas crafts, including Santa's Favorite Ornaments, Cards and Gifts from the Kids, and Easy to Make Decorations. Quick and Easy Christmas Crafts: Find over 25 quick and easy Christmas crafts for ornaments, home decor, kids' crafts, greeting cards and gift giving ideas. Crafts for every aspect of the holidays. 16 Angel Crafts to Make: Homemade Christmas Ornaments and Decorations: Angels are a beautiful symbol with which to decorate your home, whether you are decorating for the holidays or creating permanent fixtures for various rooms. Creative Ideas for the Holiday Home eBook from Creative Home Arts: This eBook is a great resource for using all of your favorite techniques to make holiday gifts and decorations. Find 20 craft projects, organized by Halloween, Thanksgiving and Christmas. 18 Homemade Christmas Decorations: How to Make Christmas Decorations: Deck the halls with some of these Christmas decorating ideas! You can easily turn your house into a festive home this holiday season with these 18 homemade Christmas decorations. Learn how to make Christmas decorations, ornaments, and Christmas outdoor decor in this free eBook. Homemade Christmas Gifts: 14 Gift Ideas & DIY Home Decor: Whether you’re looking to create your own unique holiday decor this year or you’re looking for some clever gift ideas for friends and family, Homemade Christmas Gifts: 14 Gift Ideas & DIY Home Decor is filled with great projects that are perfect for all your holiday decorating and gift-giving needs! 11 DIY Christmas Decorations and Gift Ideas: Trim up the tree and deck the halls with this brand new collection of Christmas crafts. With projects from American Quilter's Society, Elmer's, Red Heart Yarn, Sizzix, Spellbinders, M-D Hobby & Craft, Polyform, QuiltWoman.com, Sullivans USA, Testors, and Xyron, this free printable eBook has something for everyone! 7 DIY Christmas Gifts: Handmade Gift Ideas You'll Love - With great DIY gifts for the holidays, this collection is filled with great projects that you can make for friends and family alike. With fantastic projects from American Quilter's Society, Polyform Products, Red Heart Yarn, Sizzix, and Therm O Web, this holiday gift guide will help you tackle your gift list in no time. 20 Easy DIY Holiday Projects - These easy DIY holiday projects really stand out and make a statement during this bright and shiny season. Just prepare yourself - once you make one of these DIY Christmas crafts, you won't be able to stop. Before you know it, your space will be filled with DIY holiday projects and you won't have anywhere to put your tree. 11 Teacher-Approved Crafts for School: There are plenty of back to school activities that kids can make. In fact, kids just might enjoy these crafts! Back to school season can cause anxiety for some, so help create a seamless transition with these fun school crafts for kids. Summer Crafts for Kids eBook: 22 different craft projects are sure to keep the kids entertained this summer. This is a great resource for scout leaders, camp counselors and parents with bored kids! 26 Spring Crafts for Kids eBook: Spend time with this kids this spring making spring crafts for kids, including decorative clay pots, handmade flowers, and even Easter crafts for kids. There's something for every kid in this free eBook. Family Fun Crafts: 16 Craft Ideas for Kids eBook: Spend some quality time crafting with the kids using the ideas inside the free Family Fun Crafts: 16 Craft Ideas for Kids eBook. You'll instill a lifetime love of creativity in them while also creating memories that will last forever! 17 Easy Crafts With Yarn: Make Accessories, Decor and More with Lion Brand Imagine Yarn: Stretch the limits of your creativity and discover your next great DIY project - all you have to do is download a copy of this free eBook. Be sure to stock up on Lion Brand Imagine Yarn so you're always prepared to make a quick craft. Make it a Red Heart Holiday eBook from Red Heart Yarn: This eBook from Red Heart Yarn is filled with free Christmas crochet patterns and Christmas knit patterns you can make. This FREE eBook contains 26 knit, crochet, and craft projects for you to make for Christmas. Quick and Thrifty Crochet eBook: Find 25 free, easy crochet patterns to create small items in a single sitting, such as dishcloths, flowers and small baby items. These patterns are great for last-minute gift ideas. 24 Quick and Easy Knitting Patterns eBook: Find 24 great crafts you can make for yourself or give as a gift. Knit afghans, winter gear, baby knits, kid knits and plenty more! Great Gift Ideas: Knitting and Crochet Patterns from Red Heart Yarn eBook: Find 19 crochet and knitting patterns including afghans, scarves, hats, sweaters, bags and more. Find just the right project for your next autumn project. Wrap up with 25 Afghan Patterns from Red Heart Yarn eBook: Red Heart Yarn presents this FREE collection of 25 afghan patterns for your enjoyment. With 4 afghan knitting patterns and 21 afghan crochet patterns, you are sure to find just the right afghan for your next project. Easy Lace Knitting Patterns eBook: Find 12 easy lace knitting patterns for afghans, scarves, wraps, cardigans and more. Enjoy the elegant side of knitting with intricate, openwork designs. Baby Love eBook from Red Heart Yarns: If you're looking for knit patterns for baby hats, free knitting patterns for babies, free crochet baby afghan patterns, and free baby knit patterns, this Baby Love eBook from Red Heart Yarns is just what you're seeking. We've Got You Covered: 25 Crochet and Knit Throws eBook: With 25 throws to choose from, you’re sure to find the perfect crochet or knitted afghan patterns to cover up with when things get chilly. 22 Free Crochet Patterns: Afghan Patterns, Crochet Hats, and More eBook: Finally, you can get all of your favorite free crochet patterns all in one place! This free eBook contains our 22 favorite free crochet patterns, from scarves and hats to crochet flowers and amigurumi patterns--and let's not forget crochet afghan patterns! How to Knit: Beginner Knitting Help and 7 Free Patterns eBook: If you would like to learn how to knit so you can make the gorgeous designs you see everyone else making, download the How to Knit: Beginner Knitting Help and 7 Free Patterns eBook for free and you'll get started in no time. 14 Free Crochet Patterns for Babies and Toddlers eBook: New babies are the perfect excuse to crochet! Stitch something up for a baby shower, a gift for the baby's arrival, a Mother's Day gift, or the child's first birthday. 16 Free Crochet Hat Patterns, Scarves, and Gloves eBook: One look and you'll be hooked on 16 Free Crochet Hat Patterns, Scarves, & Gloves eBook! Filled with lots of easy and fun crochet projects, this free eBook is perfect for those who love to crochet fun winter accessories! Learn How to Knit for Beginners: 27 Easy Knitting Patterns: Have you been itching to learn how to knit? Looking for some easy knitting patterns that are fun to make? Well you're in luck! Learn to knit a scarf pattern, make funky baby clothes, and knit shabby chic decorating items with all these easy knitting patterns in this free eBook! From Head to Toe, Young to Old: 26 Knit and Crochet Accessories eBook from Red Heart Yarns: Discover hats, scarves, gloves, mittens, slippers, and socks to knit and crochet with this eBook featuring patterns from Red Heart Yarns. Welcome to Our Home: Knit and Crochet Ideas from Red Heart: Transform your home decor with beautiful knit and crochet patterns from Red Heart Yarn. From stunning and colorful afghans to fun home accessories, the patterns in this eBook are sure to help you transform your home into a cozy and comfortable oasis for you and your family. 12 Knitted Scarf Patterns: Fabulous Free Knitting Patterns for Beginners: Beginner knitting patterns may seem hard to find or impossible to complete, but we're here to prove you wrong. There are so many free knit scarf patterns, easy projects and other ideas to keep your needles happy all year long. 11 Crochet Shawl Patterns: Crochet Poncho Patterns, Free Easy Crochet Patterns and More: When sweater weather hits, you don’t have to settle for a traditional sweatshirts or jackets. Wear a shawl or a poncho instead and take your outfit from average to fabulous. This eBook provides readers with free easy crochet patterns that crocheters at all levels can make. 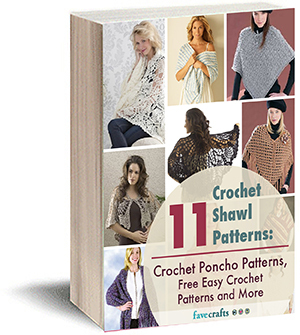 This free eBook is split into two sections, Crochet Shawl Patterns and How to Crochet a Poncho. 13 Spring Crafts: Easter Craft Ideas, Spring DIY Home Decor, and More: FaveCrafts has teamed up with some of the absolute best craft companies and designers to bring you some brand new spring crafts. Hop into Spring: Easter Crafting and Recipe eBook: Peruse 130 pages of craft ideas for Easter, including egg decorating, centerpieces and bunny crafts. Find the perfect Easter recipes to celebrate the day. Easter Craft eBook: Blogger Edition eBook: Over 60 pages of Easter craft projects from some of our favorite craft bloggers, including papercraft, sewing and crafts for kids. Easter Crafts: Blogger Edition 2010 eBook: Thanks to the contributions of 16 craft bloggers, we have put together this new collection of Easter projects. Find 19 Easter craft projects to decorate your home, give as gifts and just enjoy! Easter Eggs: Easter Egg Designs, Tips for Perfect Hard Boiled Eggs, Egg Recipes: Learn how to naturally dye your Easter eggs, make the perfect hard boiled egg, and find recipes for what to make with them when you're done! Make it macabre and spooky evening when you download this free adult coloring book for Halloween. From ghostly graveyard art to a jazzy Jack-O-Lanterns, 5 Halloween Coloring Pages for Adults is easy to download and a joy to color. Get your copy today! How to Halloween: Decorating Ideas and Costumes from Bloggers 2010 eBook: Make your costumes and decorations this year with some great decorating ideas from bloggers like you. 31 Halloween Craft Projects eBook: Have a crafty countdown to Halloween with 31 free Halloween craft projects in this printable eBook collection. Homemade Halloween Decorations eBook: With this collection of 7 homemade Halloween decorations, anyone can create a festive home without spending a bundle on store-bought Halloween decorations. A homemade meal at Thanksgiving is made all the more lovely with your own crafted décor and tablescapes. Whether you’re hosting Thanksgiving dinner or traveling to a loved one’s home, these 10 Easy Thanksgiving Crafts for Adults are a festive way to celebrate the season. This Thanksgiving holiday guide features our top 10 Thanksgiving projects of 2016. Get your copy today! Creative Crafting all Year Round: Crafts to Celebrate the Holidays eBook: Our handpicked collection of the best craft projects for every holiday. This is a great resource for crafting all year. Irish for a Day: St. Patrick's Day Craft and Recipe Guide eBook: Find craft projects to decorate your home, give as gifts and even wear on St. Patrick's Day. Complete the celebration with a collection of St. Patrick's Day recipes. 4th of July Crafts and Recipes eBook: Show your American pride with this downloadable collection of craft projects to decorate, wear and entertain on the 4th of July. Find the perfect July 4th recipes to complete your celebrations. Mother's Day Crafting: Blogger Edition eBook: Homemade Mother's Day gifts and decorations submitted by some of our favorite craft bloggers. Find free sewing patterns, papercrafts and easy projects for kids. Crafts for Mom: 30 Free Craft Projects for Mother's Day eBook: Make the perfect present for Mom this Mother's Day, whether its a card, mosaic bath jar set or easy craft for kids. Father's Day Crafts eBook: Find the perfect present for Dad with this collection of Father's Day craft projects. Find easy knitting projects, crafts for kids, homemade cards, and more. Thanksgiving Crafts eBook: Find 30 craft projects for Thanksgiving with themes such as turkeys, pilgrims and autumn leaves. Welcome family and friends to a Thanksgiving feast at your home with homemade decorations and table accents. Mother's Day Crafts: Blogger Edition 2010 eBook: Inside you will find 20 craft projects from 20 different craft bloggers. Find easy homemade gifts for Mom, fun sewing projects and wearables Mom will love. Father's Day Crafts: Blogger Edition 2010 eBook: Find 10 homemade Father's Day gifts from talented craft bloggers. You will find easy sewing crafts, paper crafts and thrifty crafts using items from around the house. 14 New Year's Eve Party Ideas, Recipes, Drinks & Decorations eBook: Ring in the new year right with this 14 New Year's Ever Party Ideas, Recipes, Drinks & Decorations eBook. From wine charms to table decorations, we've got you covered. And don't forget the great recipes! 4th of July Crafts: Blogger Edition 2010 eBook: In this eBook, you will find 20 different July 4th craft ideas from 20 different bloggers, including easy craft projects using recycled materials from around the house. 9 Thanksgiving Decorations to Make eBook: Celebrate the harvest season with this collection of 9 Thanksgiving decorations to make. These Thanksgiving craft ideas can decorate your home in warm autumn colors all November long. 24 Thanksgiving Dinner Recipes and Fall Craft Projects eBook: This eBook is brimming with Thanksgiving craft projects and recipes to make your Thanksgiving dinner celebration a hit. With this eBook, you have all the tools for an unforgettable Thanksgiving celebration! Crafts for Father's Day: 36 Homemade Father's Day Gift Ideas: Nothing says I love you more than a handmade gift, so tell Dad how much he means to you by making his Father's Day gift by hand this year. In Crafts for Father's Day: 36 Homemade Father's Day Gift Ideas, you'll find lots of great ideas for all kinds of dads. Holiday How-To: Thanksgiving Crafts and Pumpkin Recipes - Welcome friends and family to your home with the abundant blessings of handcrafted décor and food for the season. Thanksgiving is the time to reflect on the richness of your life and enjoy autumn’s great gifts. 38 Holiday Crafts: Holiday Decorating Ideas for Every Season: No matter the time of year, no matter the holiday you want to celebrate, this eBook will have the perfect project for you. Download this eBook so that you can always refer back to it, holiday after holiday. 25 Easy to Make Homemade Jewelry Crafts eBook: Quick Crafty and Simple, Perfect for Yourself or Gifts- Find 25 amazing pieces of jewelry to keep for yourself or give as a lovely gesture. Beautiful Beads eBook: Explore this inspiring collection of 45 beading craft projects, including jewelry sets, necklace, earrings and home decor items. Jewelry for You! How to Make Handmade Beaded Bracelets and Necklaces eBook from Consumer Crafts and Crafts Unleashed: If you're looking for free beading patterns, we've got 22 trendy beading ideas from Consumer Crafts and Crafts Unleashed to get you started. How to Make Bows, Hair Pins and More: 36 DIY Hair Accessories: Summer is a great time to add a little flair to your hair, and with this collection of How to Make Hair Bows, Hair Pins and More: 36 DIY Hair Accessories, you’ll be able to create fun summertime headbands, barrettes, and clips that are great for girls of all ages. 20 Bracelet Patterns: Macrame Bracelets, Friendship Bracelets, Hemp Bracelets, and More eBook: Friendship bracelets are all the rage! Get in on the trend by learning how to make friendship bracelets using the instructions in this eBook! Inside, you'll discover instructions for bracelet making, including bead bracelets and macrame. 4 Beautiful Spring Coloring Pages for Adults With April showers come May flowers! Until those blossoms bloom, we must keep ourselves occupied with indoor crafts and activities. One of the best ways to pass the time is by coloring. With our new collection of 4 Beautiful Spring Coloring Pages for Adults, your rainy April days will pass by in no time. Best Blogger Craft Ideas 2016: DIY Home Decor, Paper Craft Ideas, Sewing Projects, and Unique DIY Crafts These DIY crafts are the best of the best! Voted on by you in our Best Blogger Craft 2016 contest, these craft project ideas were created by some of the best and brightest bloggers in the crafting world. Make it Yours How To Spray Paint Furniture, Home Decor Projects, Holiday Crafts and More with Krylon Spray Paint: You don't have to spend an arm and a leg on expensive supplies and tools. Instead of discarding old or non-working home decor items, coat them in Krylon Spray Paint. 23 Fabulous Picnic Craft Ideas + Restaurant Copycat Recipes: Before you feel the need to head outside for a little fresh air, consider a few picnic craft ideas. Also, we've teamed up with our friends at AllFreeCopycatRecipes to bring you some of our favorite copycat recipes, meal ideas and more. Quick & Easy Decoupage: 12 Fabulous Mod Podge Projects for your Home eBook from Plaid: In addition to show-and-telling you how to use Mod Podge, the book with Mod Podge including decoupage ideas and instructions from the experts. 24 Simple Scrapbooking Layouts eBook: This eBook provides you with 24 great scrapbook pages and layouts including pages for great family memories, fun summer days, special moments and much more. Garden Crafts eBook: Spruce up your outdoor space with a craft project for the garden. Find useful projects such as planters and watering cans, and more decorative projects such as mosaic stones. 42 Ways to Recycle eBook: Find 42 ways to recycle materials such as glass, plastic, paper and metal for craft projects. 24 Handmade Craft Ideas from 2010: A Year of Free Crafts eBook: This eBook features a roundup of the most popular craft projects from 2010. You'll find 24 projects to wear, decorate your home with, or give as gifts, from knitting and crocheting to sewing and crafting. 31 Cupcake Inspired Creations eBook: Cupcakes are such a trendy craft theme right now, so check out these zero calorie cupcake crafts to make. These 31 Cupcake Inspired Creations feature something for everyone, from sewing patterns and paper projects to painting and beading. Project Ideas for All Occasions From Paper to Fabric Volume 1 eCraft Creations eBook: Make your own paper creations with 21 free projects from Craftwell and FaveCrafts. Find one-of-a-kind projects for home, gift-giving, and more - all in this free eBook. How To Create 14 Sparkly Craft Projects Using Krylon Glitter Blast eBook: If you've been looking for great projects showing you how to paint with spray paint that glitters, shimmers, and shines, Krylon has rounded up 14 fabulous spray painting crafts in this free eBook. 24 Tie-Dye Techniques: Free Tie-Dye Patterns: Included in this book are fifteen different tie dye designs and nine tie dye patterns. Read through the techniques first, and then try out your new skills by making one of the projects we've included in the eBook. How to Make Tie Dye Shirts, Decor, & More: 18 Tie Dye Patterns: Included in this book are eighteen tie dye patterns to wear, use around the house, or give as a gift. Make over your wardrobe in minutes with these fun and easy tie dye patterns. Crafting With The Craftwell eCraft and eBosser: Scrapbooking, Paper Crafts, and So Much More: In this second volume of Craftwell projects, titled Crafting with the Craftwell eCraft and eBosser: Scrapbooking, Paper Crafts, and So Much More, you'll learn how to make eye-catching 3D greeting cards, fun centerpieces for a baby shower, and cute home accessories that are sure to please anyone. 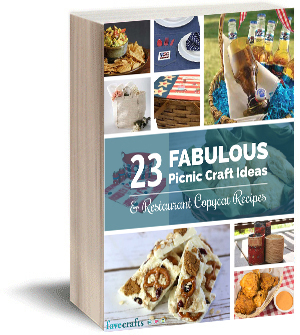 The Ultimate Craft Guide: 25 Free Craft Projects for Every Crafter: FaveCrafts has teamed up with Michaels Craft Store to bring you a new eBook, filled with never before seen projects that we know you’re going to love! Broken down by category, the projects in The Ultimate Craft Guide cover a wide range of crafting mediums, so there's bound to be something for everyone. 18 Crafts with Felt: Simple Craft Ideas, Felt Flowers & More: Felt is one of the most versatile, easy-to-use materials for crafting. If you're looking for felt ideas, look no further than this eBook, which features tutorials for felt flowers, purses, crafts for children and so much more. You never know when crafty inspiration might strike, so be sure to print out a copy and keep this as your resource for easy craft ideas. Fuse Creativity System Project Guide: Fun Party Themes, Idea for Handmade Cards, and More Paper Crafts from Fiskars: Paper crafts are some of the most popular projects on the market today. From handmade cards to beautiful home decor, a simple sheet of paper can go a long way...and you won't believe the amazing things you can do with your Fiskars Fuse Creativity System and this free downloadable eBook. 24 Polymer Clay Tutorials: Polymer Clay Jewelry, Home Decor, and More: From simple jewelry to more elaborate and artistic decorations, you won’t believe all the amazing things you can make with a little block of clay. Decorate your home, liven up your accessory collection, and transform every day materials from drab to fab with these amazing Polymer clay tutorials! 17 Flower Craft Ideas: How to Make Paper Flowers, Easy Fabric Flowers and More: These crafts are perfect for a variety of different situations: Mother’s Day, a friend’s birthday, Valentine’s Day…the list goes on. Get creative with making these fabric and paper flowers. With this free eBook, you’ll be able to create flowers that will last you forever. 18 Projects Every Crafter Wants: The projects in 18 Projects Every Crafter Wants cover a wide range of crafting mediums, so there’s bound to be something for everyone. Craft along with us as we celebrate creativity, imagination, and inspiration all year long with this special title. The Best Blogger Craft Ideas 2014: We asked, you voted. We've gathered up the best blogger projects from our Best Blogger Contest into a special eBook, The Best Blogger Craft Ideas 2014: Decoupage, Sewing, Jewelry Making, and More. In this eBook, you’ll find amazing projects for jewelry crafts, chalkboard crafts, floral crafts, home decor crafts, and kid crafts. How to Paint Furniture: 19 Upcycled Furniture Projects free eBook from DecoArt: Give your home a makeover with this new free eBook from DecoArt and FaveCrafts.com. How to Paint Furniture: 19 Upcycled Furniture Projects is filled with awesome ways to transform tables, bookshelves, cabinets, and more! Fun with Fabric Dye eBook from Tulip: This is the ultimate handbook for inspiration and instruction on a multitude of fabric dye techniques. Find 28 fabric dye craft projects organized by 18 dye techniques. Plus, find two "tie-dye" ceramics crafts. The Best Blogger Craft Ideas 2015: Home Decor Ideas, DIY Jewelry, Easy Crochet Patterns and More: We've gathered up the best blogger projects from our Best Blogger Contest into a special eBook. You'll find amazing DY home decor ideas, knit and crochet projects, and fun recycled crafts that you can make with items already in your home. Painting the Seasons with Americana® Multi-Surface™ Acrylics: With home decor projects that are perfect for summer, fall, winter, and spring, this eBook is all you need to make sure that your home is ready for every celebration. Start off your crafting journey with an introduction to Americana® Multi-Surface™ Acrylic Paint. How to Tie Dye: 10 Tie Dye Instructions & Techniques - Once summer hits, there's nothing more fun than creating your own tie dye patterns. Our latest collection will help you learn the basics and discover techniques. In addition to learning how to make tie dye shirts, you'll discover ways to decorate onesies, bandanas and even a scarf. 13 DIY Home Decor Ideas - Create DIY home decor ideas you're sure to love with our newest free eBook from Stencil Ease. Filled with clever and creative ways to transform everyday items into classy knockoffs that look like the real deal, this eBook is a must-have for any DIY'er. 7 Adult Coloring Pages - When it comes to free coloring pages, you're never too old to get started. This 7 Adult Coloring Pages free eBook is filled with relaxing, calming graphics for you to color. Once you've completed your coloring page, you'll feel more in touch with yourself and more relaxed overall. Sewing for Beginners eBook: Find 20 free sewing patterns and great resources for those learning how to sew, including guides to needles, caring for fabric and more. 21 Easy Sewing Projects: DIY Designs and Sewing Craft Ideas: Find tutorials and patterns for everything from practical and budget-friendly clothing patterns, holiday projects, lovely bags and clutches, and decorations for your home. 8 Free Apron Sewing Patterns eBook: In response to reader demand, we have put together this quick collection of 8 Free Apron Sewing Patterns. These free apron sewing patterns come from craft bloggers, independent craft designers and a few craft manufacturers to give you a nice selection of ideas. DIY Wedding eBook: Planning a wedding? Save money with free craft projects for centerpieces, favors, invitations, flowers and more. Also find bonus tips on decorating for your wedding. 33 Summer Wedding Ideas: If you're planning a wedding this summer, check out our free eBook on summer wedding ideas, where you'll find great money-saving tips on summer wedding flower ideas, wedding centerpiece ideas and do it yourself wedding crafts to make your big day truly special. Crochet Patterns, Painting Ideas, and More: 15 New DIY Crafts eBook: Whether you are a crochet enthusiast, amateur painter, or jewelry aficionado, this book has something for every crafter. 16 Toilet Paper Roll Craft Ideas eBook: Toilet paper roll craft ideas can help you save money and great creative at the same time - you won't believe how easy it is to come up with creative toilet paper roll crafts for the entire family. You can great pretty jewelry for yourself, decorative bracelets for kids and decor for your home - all with the help of a few cardboard tubes. 12 Thrifty Trash to Treasure Crafts eBook: If you hate throwing anything away, you'll love this collection of thrifty crafts. Learn how to transform any piece of trash into a beloved treasure with this free eBook featuring 12 trash to treasure crafts. Cheap Home Decor: Crafting with Paper eBook: If you are on a craft budget (and who isn't in the current economy? ), have a look at this collection of 60 low-cost craft projects, sorted into categories such as needle craft, home decor, crafts for kids and more! Great Decor in a Flash Without a Lot of Cash eBook from Dow: This new eBook from Dow Chemical Company is full of home decorating ideas using STYROFOAM™ brand foam. Find 29 craft projects for low-cost wall art and other decorative accents. Inexpensive Home Decor eBook: Save money on home decorating with fun craft projects. This craft collection is organized by room for easy reference. Trash to Treasure: 28 Recycled Crafts: Looking for some clever ways to use up items around your home? If you have an overflowing stash of toilet paper rolls, Mason Jars, pop cans, water bottles, fabric scraps, and newspapers, this eBook is for you! Low-Cost Clothing Crafts eBook: Find 32 low-cost clothing craft projects to create fashionable clothing and accessories, whether you knit, crochet, sew or do none of these things. Low-Cost Kitchen Crafts eBook: Redecorate your kitchen or create pretty kitchen essentials with 39 low-cost kitchen crafts, including crochet patterns, fridge magnets and easy painting projects. Cheap and Easy Crafts eBook: Keep your favorite hobby and keep crafting on a budget with 60 cheap and easy craft projects. 25 Cool Things to Do with Wine Bottles: Have you ever looked at an old wine bottle and wondered, “What can I make with this?” In an era when recycling and reusing are all the rage, it seems like a waste to toss a perfectly good wine bottle into the recycling bin…but with the help of our free eBook, 25 Cool Things to do with Wine Bottles, you’ll find tons of great DIY wine bottle crafts that are decorative, useful, and earth-friendly! 20 Crafts with Mason Jars: Wedding Ideas, Centerpieces, Decor, and More: With the help of our new free eBook, 20 Crafts with Mason Jars, you’ll be able to take all those versatile glass bottles and transform them into decorative and useful accents for your home or office. 12 Easy DIY Projects: Whether you're looking for easy DIY home projects or just want to make easy DIY projects for your friends, this is a must-have collection. Find out why this free eBook should be added to every collection.There's no better way to spend a day than creating something you love, and the projects featured in the free eBook will appeal to every lover of easy DIY projects. 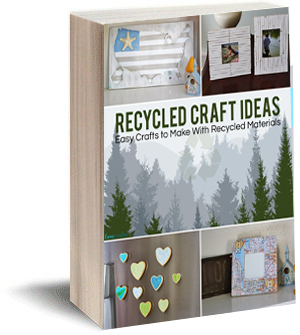 Recycled Craft Ideas: Easy Crafts to Make with Recycled Materials: Filled with amazing new recycled projects, this eBook is the perfect way to celebrate Mother Earth. Cupid's Handmade Crafts eBook: Get in touch with your romantic side with over 30 cute Valentine ideas for handmade accessories, gifts, cards, home decor and kids' crafts. Surprise your loved ones this Valentine's Day. 41 Valentine's Day Crafts: Valentine's Day Cards, Gifts, and More: From simple handmade card designs to beautiful heart-themed crocheted afghans and sachets, the projects in 41 Valentine's Day Crafts: Valentine's Day Cards, Gifts, and More are sure to inspire you to make something for your Valentine. 24 Valentine's Day Crafts for Kids: Lovely Kids Craft Ideas and Projects: These 24 Valentine craft ideas for kids include homemade Valentines that kids can make for their friends and loved ones, crafty Valentine's Day decorations for your home, and school party crafts that kids can make with their classmates and teachers.